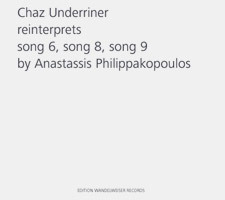 As I hear it, Anastassis Philippakopoulos' music moves from event to event. They appear and sound fluid - but this is deceptive. Close experience with them, listening as Anastassis does repeatedly to the same succession, reveals that each tone arises from a decision. For Anastassis, a choice is an event - something to be weighed and evaluated. It is also a new beginning, a thing that puts other things in motion. with its own history of erosions and accidents, and a musical object that can never fully be grasped, only heard and heard again. Instrumentalists are challenged to find the song in a succession of events. 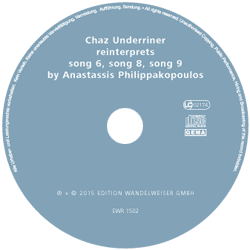 Chaz Underriner's work with Philippakopoulos' music on this disc shares this insight. It is both an analysis of the melody events in three of the Song series and a new work in its own right. By exploding the duration of the pitches and putting distance between them (projecting the songs on a different scale altogether), very little of the "tune" remains audible. He makes a desert of a mountain range, rendering each tone with sensitivity to local detail, and turning melody into an experience we only have as a trace, and then only when it is completed.